On Saturday, I attended Insight: a low vision expo put together by Community Services for the Blind and Partially Sighted. With about 300 people preregistered and many more registering onsite, it was an interesting and diverse group of mostly older people. Some fell into traditional classification of blindness. Others could be placed more on a spectrum of vision ability due to a number of age-related conditions. Of adults age 40 or older in the United States, more than 2 million have glaucoma, more than 4 million have diabetic retinopathy, and more than 1.75 million have age-related macular degeneration, according to the National Eye Institute. They were all well-represented at this event. Part of this is that a number of accommodations are simple customizations that simply make sense for our aging population. However, the disability label doesn’t sit well with people who still feel relatively independent. Dan mentioned the problem his dad had with clicking on the Control Panel’s wheelchair icon in Windows XP to get to the accessibility options he needed. “That is not me,” he told Dan. He didn’t feel disabled and wasn’t about to consider himself that way. Now Microsoft uses a more abstract icon to get to the same features and calls them “Ease of Access” instead of “Accessibility Options”…and we all use them in one way or another to see, hear, and move more successfully in Windows. This shift from accommodation to usability is not surprising. While the Americans with Disabilities Act drove cities and municipalities to create “curb cuts” or ramps at street corners to accommodate wheel chairs, the primary users of those cuts are people with baby strollers and bicycles. A feature that I added to my kitchen during a remodel a few years ago was a cabinet that raised the dishwasher off the floor. While this is a feature initially designed for wheelchair users, it is now an option among cabinet makers. Why? Besides the offering it as an accomodation, it simply makes sense to raise the dishwasher loading area to a more comfortable level. The term Universal Design is now used to describe this approach and is now part of college curriculums for architects, product designers, and engineers. Dan in his keynote highlighted some of the more dramatic Ease of Access features in Windows 7, an updated Magnifier application and Screen Recognition, a feature that first appeared in Windows Vista. Both are great option for Windows users who have difficulty seeing or controlling applications. He also made a brief reference in response to a question from the audience about changing font sizes in Windows. The shortness of time prevented Dan from doing into this area in more depth other than mentioning the option to make the text on your screen larger or smaller. This ability is also available in other versions of Windows besides Windows 7 but is less discoverable. Given that this feature is more useful if you understand a little be more about it, we will explore that option in an upcoming blog entry. 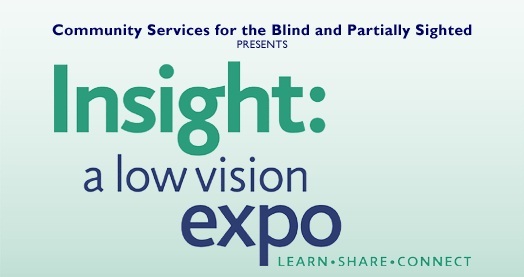 This is the first Insight expo hosted by Community Services for the Blind and Partially Sighted. Unlike a number of other disability conferences, the attendees for this event were not largely disability advocacy groups, accessibility aids vendors, or consultants. They were regular people from all walks of life in search of information and resources to help them be creative and independent as they grow older and deal with vision impairments. I had a great time and got to meet some very interesting people. Hats off to CSBPS and their sponsors for making this event happen!